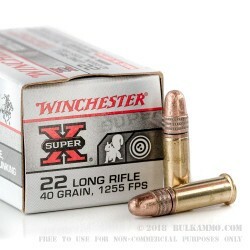 The Winchester Super-X .22LR is among the more reliable .22 LR ammo in existence. The history of functionality across platforms and build types is incredibly consistent. This consistency has led to shooters who know and love Winchester Super-X as their go-to ammunition not only for .22 long rifle but across the whole range of calibers in the line. This is Winchester’s Super-X 40 grain copper plated load that is suitable for very small game and general shooting purposes like target practice and plinking. 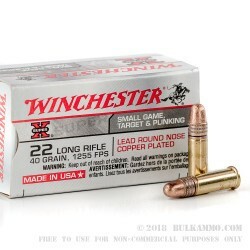 Winchester .22 Long Rifle has, along with a handful of other longstanding lines of .22LR have literally written the history of the .22 in the modern era. Their attention to detail and quality choice for components have kept the legacy alive of the “way things used to be made”. So much of what we see in today’s landscape of firearms and ammunition can trace its roots back to an initiative or a new product by a company like Winchester. 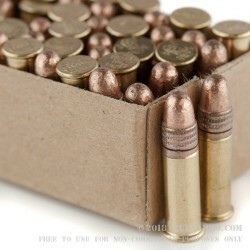 Super-X, similarly has spawned so many innovations in the modern ammunition game, with the high level of quality and the sophistication of the engineering in the processes and manufacture of ammo.